Our Story - Affiliated Adjusters, Inc. Affiliated Adjusters: An organization whose members have served in the Western United States For Over 60 Years! 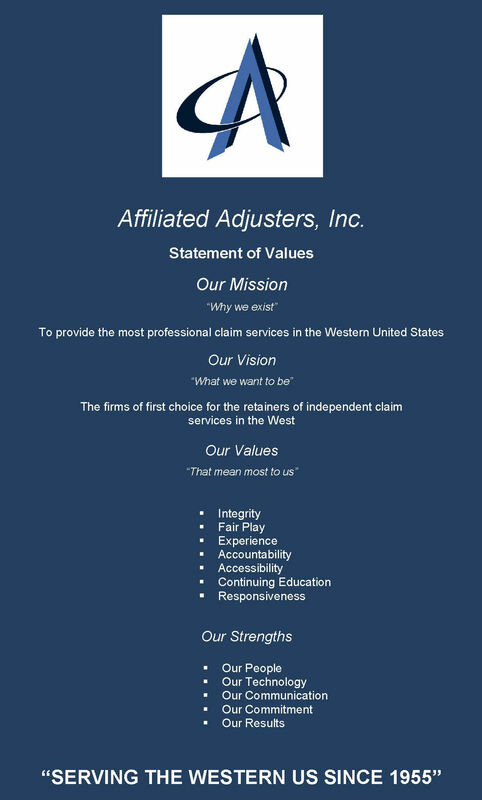 In 1955, in order to provide a broader range of locally specialized services to the claims industry, a group of leading independent adjusting companies in the Western United States joined together to form Affiliated Adjusters, Inc. Despite myriad changes in the insurance and self-insurance claims industries over this past half century, AAI’s members have continued to provide consistent, results oriented claims investigation and administration services. Today, AAI is comprised of member companies with strategically placed field offices in the majority of western states including Alaska. As independently owned businesses, each AAI member offers stability in personnel and knowledge of the laws and practices in each of their territories unequaled by other national and regional claims companies. Our membership is experienced in every major type of claim situation, from routine commercial and personal lines claims investigations and settlement, heavy equipment/trucking claims, environmental claims and municipality claims to full disaster response teams and full property, casualty and workers’ compensation program management. AAI members are supportive of continuing education as well as community involvement. Various members of AAI are certified CE providers in their home states and have presented to regional and national conventions. A majority of AAI members belong to the National Association of Independent Insurance Adjusters (“NAIIA”), with many having achieved designations such as CPCU and RPA. AAI membership is comprised of members with a great deal of claims industry experience. Our members have served in the insurance industry in high-level positions including Chief Operations Officer, Chief Financial Officer, Chief Claims Officer and Claims Vice President, in addition to many Claims Managers at the local, regional and national levels. If you are already familiar with AAI, you no doubt have already realized the long-term value offered to our client companies. If you are just becoming acquainted with us, please feel free to call us toll free at (800) 676-2332 or call directly upon any of our members who will be happy to answer your questions. We are confident that when given the opportunity, we will clearly demonstrate to you how our mix of industry management experience, overall claims experience and local expertise can add value to your claims handling initiatives. Over sixty years of continuous, consistent claims service. Local business people with local community service involvement. Coverage for claims in the majority of the Western United States. All lines of insurance and self-insured claims. © 2019 Affiliated Adjusters, Inc.